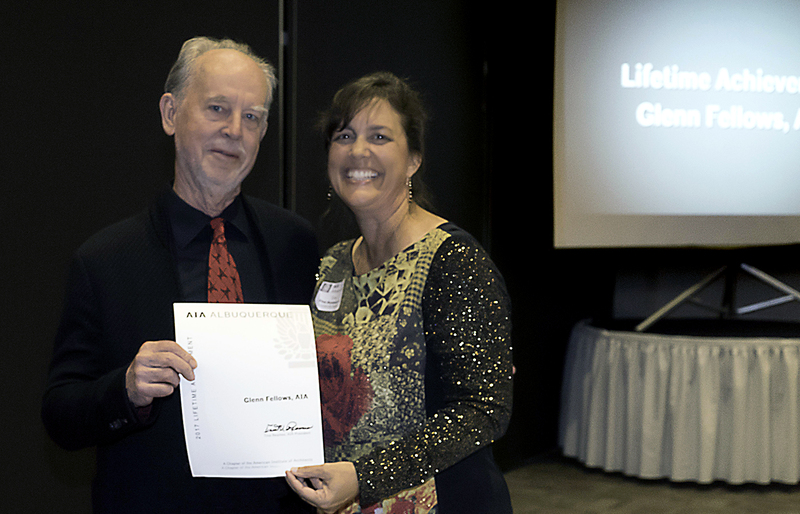 On December 8, Glenn Fellows was honored at the 2017 AIA Albuquerque Awards Banquet with the Chapter’s Lifetime Achievement Award. Glenn has been an active AIA member since 1976, highlighted by terms as AIA Albuquerque and AIA NM President, and Western Mountain Region Director on the National AIA Board of Directors. He has assisted jurisdictions statewide in maintaining the Qualification Based Selection process for professional design services. As a member of the Technical Advisory Committee to the General Building Bureau of CID, he has reviewed and advised on building code variances, amendments and adoptions. Glenn’s support for our Chapter has included a role he’s championed since 1998 – Chair of AIA Albuquerque’s annual Golf Tournament. As a coordinator and ace player with a killer drive and a solid short game, his efforts have helped make the event one of the Chapter’s most significant fundraisers. Glenn’s leadership and contributions to the profession of architecture are exemplified by his over 40 years of professional practice at SMPC Architects, his work in government affairs and legislation, and his service to the community. His generosity, kindness, and philanthropy have benefited all of us and we are forever grateful to Glenn as the Architect, the Professional Advocate, and our Friend.